rich in amino acids.buy tender ones without thorn and the skin can be used to make chutney.tasty. Wash and peel the skin of chow chow and cut into small cubes.Remove the seed. Heat oil in a kadai and splutter mustard,urad dal,red chilli,curry leaves,hing. Add chow chow cubes and haldi.Sprinkle water and close it with the lid. It will be cooked in 10-12 minutes. Keep on medium flame. Add coconut and salt at the end and mix well. Chow chow curry is ready.u can try with rotis it really tastes well. Note: Instead of coconut u can add onion.u can steam for 10 minutes in the cooker without whistle and season it. 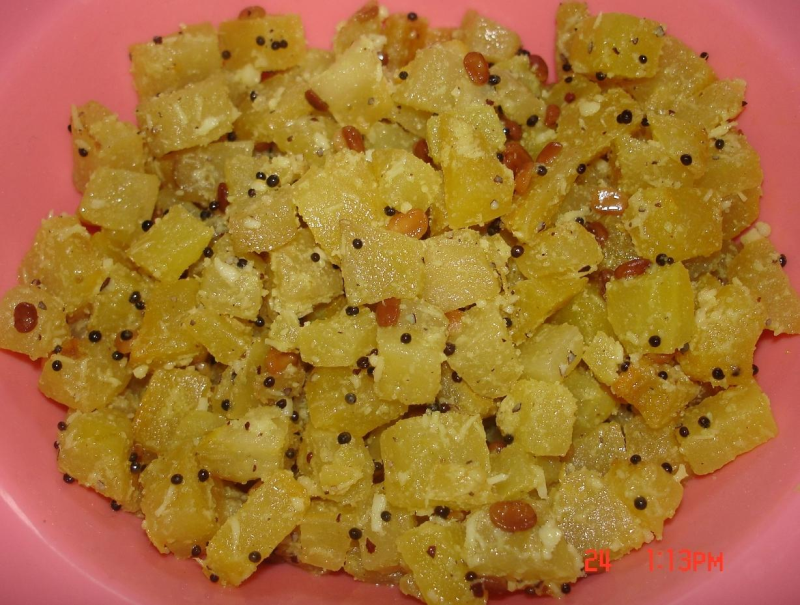 Happy to see ur recipes here again Rajeshwari!.This recipe is a good one with nice Click.